Over the summer, a subcommittee of the Waste & Recycling Working Group met to focus on how to improve composting in dining halls. The subcommittee included Gayle Donohue, Assistant Director of Student Dining, the dining hall unit managers, a number of interested students, and a member of the Zilkha Center for Environmental Initiatives. The group decided to 1) improve and update the dining hall clearing station signage, 2) recruit and train student volunteer “Greeters” to offer guidance at clearing stations at the start of the school year, and 3) assess if the number and location of waste bins in each dining hall adequately addressed the student traffic flow through the dining halls and change bin location and size where appropriate. Mike Noyes in the Carpentry Shop constructed great new signs with 3-D examples of all the compostables from each dining hall. 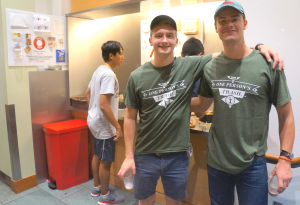 Students paired up with dining hall unit managers and did a walk-through of each unit to assess waste bin location to target trash that students might bring into dining halls before it got to the clearing station area. In a number of dining halls, it was decided to install smaller trash cans in the clearing station since most items in the dining halls are now reusable or compostable. And numerous students volunteered to be “Greeters” / “Compost Guides” in the clearing stations for two targeted time periods – two days at the start of First Days and the day before classes started and the first day of school. There’s more work to be done, but with lots of great contributions, it feels like we are starting the year on the right foot. 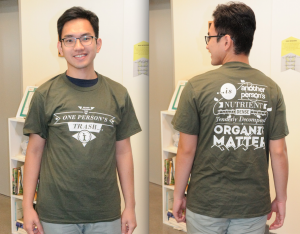 Quan models the t-shirt he designed for this initiative. 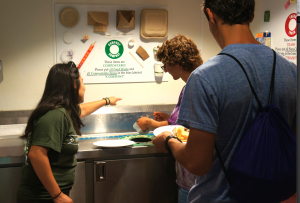 What is compostable in Dining Halls? Where else can I compost other than dining halls? Currently that is the only place where there are compost bins on campus. There are two small garden compost bins next to gardens on campus, but those are meant for plant detritus and the occasional apple core and banana peel. Not meat or compostable flatware. T-shirt questions… The t-shirt says “Williams Composting Team” on the front. Is there a Williams Composting Team? Also, who designed the shirt? There is not a officially a Williams Composting Team. A group came together for this beginning of the year initiative, but currently there is not a student group or another “team” that focuses solely on composting. If you are interested in starting one – great! The Zilkha Center is excited to talk to anyone who would like to spearhead such an initiative. Quan Do (pictured above) designed the t-shirt. He was a Zilkha summer intern who focused on graphic design, mostly on interpretive signage for the Envi Center. But he also created this cool shirt. Here’s more about this initiative – from The Record.